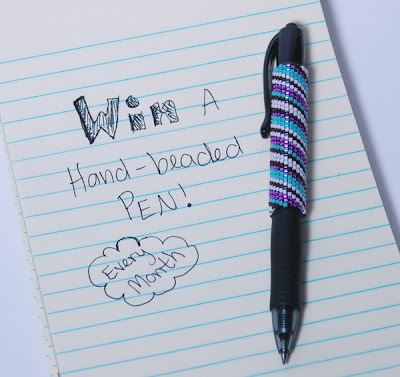 Mandibeads: September Giveaway: Win A Pen! I'm giving away a FREE PEN, every month! The winner of the September Giveaway can choose any pen in my shop, MandiBeads! This contest is open to international residents, as well! To enter the September Giveaway, leave a comment under this post and tell me about your favorite pen in my shop, or suggest a new design! Subscribing to my newsletter gives you an additional entry! The winner will be announced September 30th. Thanks to The House of Mouse for inspiring this contest. Click here to enter to win a mouse! Hi Mandi! I love all of your pens, but if I had to choose, I'd pick either the aqua swirl or the turquoise peace sign!! Getting ready to retweet your giveaway. Have a good one!-Lisa c.
You want me to pick just one? That's hard, but I finally decided on Vertigo 5, because I like blue. You do good work! Congratulations and good luck on your business! I want one!! Super cute! Mandi - I'm a new visitor here. Got here through @SisterDiane on Twitter. I'm digging your pens! Nice work. I have to say the Cupcake pen is my favorite! I'm on a cupcake kick. Although they are all great! I've never been able to figure out beading to save my life. The purple cupcake pen is my favorite! Purple is my favorite color and who doesn't like cupcakes!?! 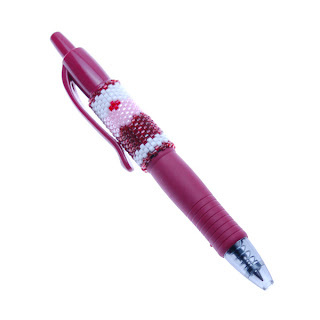 Red velvet cupcake pen all the way! I love the Vertigo 5 pen! The "Hug Me Pen" is my favorite for sure! I love it! Just one favorite?! They are all beautiful. I particularly like the purple cupcake pen. Thanks for the giveaway!